In September, Conor and I went to our friends’ wedding in Amalfi, Italy. It was a dream: the clear blue water, the mountainous terrain, lemons everywhere, THE FOOD. It was a truly magical and beyond romantic experience. While we were pretty much occupato the entire time we were there, I could not help but notice what an amazing spot it would be to honeymoon! Here are some of the most romantic highlights from our trip. Allora, andiamo! If staying there isn’t your cup of tea, they have lemon experience tours! This company owned our AirBNB and had a booming tour business. You definitely don’t want to miss the more mountainous side of town. Yes, this is really us. Can you feel the bliss?? Um, the picture above says enough, right? The pools are built into the rocky terrain, and have access to the sea. It’s private and quiet compared to the nearby spiaggie (beaches)! Maybe the highlight is a little Italian man named Pepe who runs the show there. Watch out, he may become your new best friend. Can you even with that crystal clear, turquoise water? I CANNOT. Taking a day trip to Capri is a must. Capri is a little island about 20 miles away from Amalfi. It is a bit of a tourist mecca, so best to go in the off season if you can. It’s probably most well know for its blue grotto. We visited a private beach club, La Canzone Del Mar, while we were there. We had a fabulous lunch and swim there. Be aware, if you do choose to swim there, they will charge you €! The view from Villa Eva - the reception venue for the wedding. Ravello is a charming town set in the hills looking down on Amalfi and the sea. It’s a little slice of heaven. It’s where the wedding actually took place, so we didn’t have time to do enough exploring. But can you beat cocktail hour in the main square in town after a fresh summer shower? The views are unbeatable. 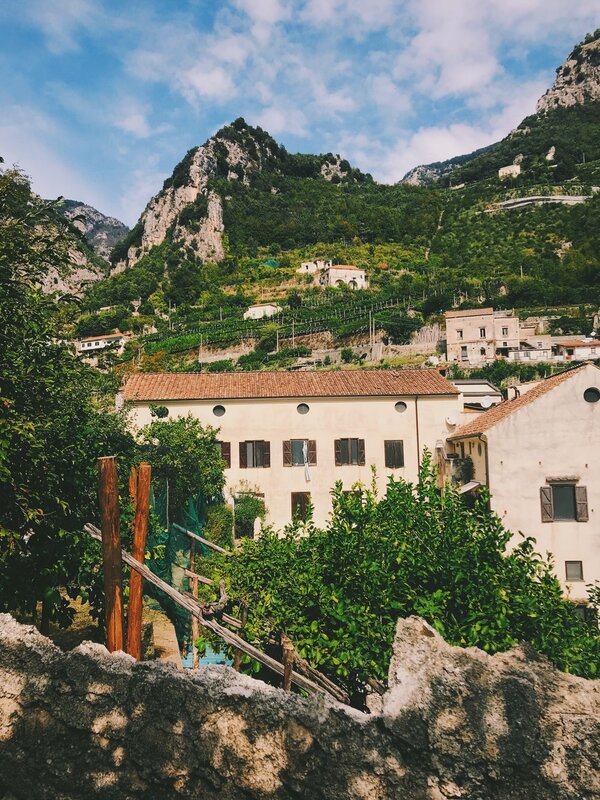 You can apparently hike to and from Amalfi, but I wouldn’t recommend it in heels! The town almost transports you back to a simpler time. Don’t miss it. This was served in a parmesan cheese bowl. I’m still drooling, months later. A little prosciutto panini? Yes please! Grilled octopus (polpa griglia!) in a chili tomato broth. Absolute heaven. Yes- enjoy the carbs. But don’t miss out on some of the freshest seafood ever. We are talking literally fisherman to table here people. The grilled octopus shown above may be the best thing I’ve ever eaten in the entirety of my life. And yes, don’t sweat the carbs and fat. You are walking enough to just enjoy. Also, food is real in Italy. Ingredients are better, fresher, and food isn’t over processed. Soak it all up! Try to avoid the tourist traps though. Things to watch out for- Alfredo sauce (an American invention), the use of the word “marinara” (another American invention! ), and pictures on menus. Go shopping! The Amalfi coast is known for it’s gorgeous painted ceramics. Stock up! Don’t drive. Please don’t drive. But, if you do drive: it’s critical to pick up your car within the reservation time. Unlike in the US, they will give your car away, and automatic transmissions are hard to come by. If you aren’t comfortable driving a manual transmission around coastal cliffs and hills, that is. We ended up in a SUV. We had to drive it through the tiny narrow streets all the way up to our AirBNB. Our Italian host literally called my husband a hero for not hitting anything or anyone. No one needs that kind of stress! There are ferries, trains, and buses that can get you where you need to go! Positano. We were supposed to visit Positano but our plans were disrupted. From what I hear, it’s also on the not to be missed! I have been blessed to have been to glorious Cape Town on two occasions, the first time to visit my BFF when she lived there back in 2012, and the second time I tacked on a visit after her wedding (May 2018) in Durban, South Africa. Both times I wanted to move there. I am a sucker for the combination of mountains and ocean in one location. But besides the absolutely jar dropping landscape; it has an enthralling history, a rich culture, and friendly people. Photos featured are all my own. Attraction titles link (when available) to website resource. The magical Kirstenbosch Botanic Gardens. This may be my favorite place in all of Cape Town. For a small entrance fee you can wander the gorgeous botanic gardens. It was the perfect place to journal and reflect. Can't you feel the good juju even in the one photo above? There is an abundance of flora, fauna, and animals. One of my favorite things I stumbled upon was a tree canopy walk, which was super cool. Maybe the best part? They have free concerts and you can picnic there! There are various routes to hike your way up Table Mountain. Back in 2012 I did it with the girls and almost died (not really, but it was hard) and my camera actually did die, and I got no pics from the top. It was very sad! However, if you aren't into the hiking route, there are gondolas that take you to the top! All of the view, none of the work! Also, the best part of the gondola IMO is that if you hike to the top you can gondola down. Me at the top of Lions Head! Very proud moment indeed. This hike is not as intensive as Table Mountain and relatively quick, but if you miss the sign you could end up climbing vertically with random ladders and chains built into the side of a mountain, ahem, like me and apparently this guy. That being said I have a fear of falling from great heights, and I was able to push through and hike this by myself. It was definitely scary at times, but I think if you were with another person it would be a-ok. The views are absolutely unreal, and not to miss. Boulders Beach... where my penguins at? This look brought to you by 2012. A gorgeous beach laden with, big shocker, boulders and also where the penguins call home. It's a perfect place for a chill afternoon, get some sun and spend some time with our feathered pals. I took hundred of penguins pics. All of the cuteness. Honestly, I don't have anything to add. Could you imagine anything better? Baboon friends who attacked our picnic. Don't worry, official "baboon security" came to our rescue! This winery is gorgeous and the oldest wine producing farm in the country. It's a great option if you want to include wine tastings in your trip but don't want to head all the way to Stellenbosch (the major wine region). Groot Constantia is easily accessible from the city tour buses. If you're lucky, you will get to see some baboons like we did! Known for its stunning scenery, the Cape of Good Hope marks the point where a ship begins to travel more eastward than southward. Our guy, Bartolomeu Dias, was the first modern explorer to round the cape in 1488. It used to be thought of as the place where the Atlantic and Indian Oceans meet, however, modern cartography tells us that isn't quite right. 🤔🤔🤔 Go there for some stunning views and a feeling like you are on the edge of the world. Oooo Table Mountain, your backside looking good, girl. Beautiful beaches. Great dining options. No brainer. It's probably one of the more accessible beaches if you are staying in the city. It feels like you've stumbled upon a beach town in the midst of the city. The stunning landscape makes it easy to forget some of the heartbreaking history in this beautiful place. I recommend you read up on apartheid before you travel there, because while it ended in the 90s, it has shaped a lot of what exists today in South Africa. 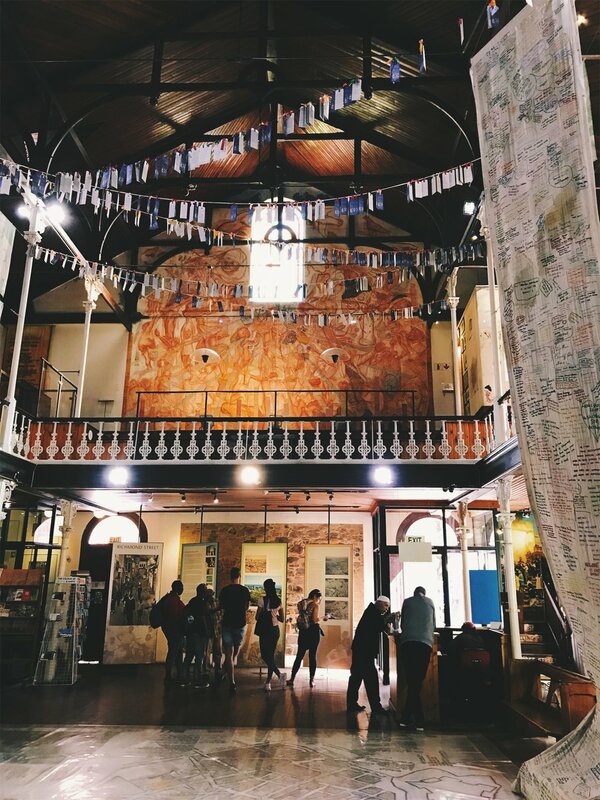 The District Six Museum, established in December 1994, works with the memories of the District Six experience and with that of forced removals more generally." Robben Island was home to a maximum security prison that held Nobel Laureate and former president of SA, Nelson Mandela, for 18 of his 27 years in exile. Two other political inmates held there, Kgalema Motlanthe and Jacob Zuma, also went on to become president of South Africa. It is definitely a somber experience visiting the island, but being there to learn and feel the history are the makings of a life changing trip. This article is a great read for further information. View of the mainland from Robben Island. Mojo market is an indoor market with beach views. Amazing food and drink (see below) vendors and some really cool unique boutique retailers. There was also a yoga studio down the street, but I was sick so I wasn't up to it that day. That being said, the Sea Point area seems like the go to for all your wellness finds! You can even go for a run on their beachfront running path. Yep poke made it all the way to SA. This bowl hit the spot after a long day of touristing. There is no shortage of spas or yoga studios around, but as I didn't have a chance to experience them, I won't elaborate on my findings. If you want more- this article from Well + Good was very helpful! Located in the heart of the city, there are some super cool markets. It definitely is targeted at tourists, but you can find a lot of really cool local artisan finds there too. You can definitely barter, but try to do it ethically. If you are coming from the US you can probably afford to pay their mark up. It's a safe area, but people with ask you for money or to buy them food. The architecture surrounding the square is gorgeous and makes for a scenic shopping trip. I only have stayed at one hotel in Cape Town, but I couldn't recommend it more. The Tree House Boutique Hotel was amazing and the staff were beyond helpful. My stay came with complimentary breakfast, which was incredible. It had a transitional fresh tree house vibe with hints of balinese. Basically, made for me. It was walking distance to the V&A Waterfront, the boojiest Woolies (Woolworth's) I've ever been in and some great restaurants and gelato! Muizenberg beach - colorful shacks on the beach? Yep, that's Muizenberg. Great for surfing or beach yoga! Stellenbosch - incredible wines come from Stellenbosch. Wine tasting sounds like a pretty romantic way to spend your honeymoon! Cape Town is running out of fresh water. To prevent this, they have enacted lots of water conservation efforts in order to preserve water. This has deterred lots of tourism from the city and country. I can tell you, this did not negatively affect my stay in any capacity. If anything, it helped me to realize just how much water I waste on a daily basis. Please do not overlook this glorious place for that reason- the lack of tourists has had a huge impact on the people and the economy. Shoreditch is in East London, and is known to be an eclectic and diverse neighborhood. Incredible street art. Amazing coffeeshops. It felt like the perfect place to be. We stayed at the Ace Hotel, and could not speak more highly of the experience. It's a very cool place. Live music almost every night, awesome lobby designed for getting work done. Minimalist and hip, it felt very in tune with the East London neighborhood it resides in. Besides that, the hotel found out it was my birthday and sent champagne and brownies - they know a way to a girl's heart. Attached to the Ace Hotel, this is a completely women-owned and operated juice and crystal shop. My own Mecca. The ladies who work here are super knowledgable about their adaptogens AND crystals. I loved chatting with them. It's also externally attached to the Ace, so very convenient if you are staying there or in the neighborhood. GF, Vegan Avo Toast at Redemption. This spot is LEGIT. Vegan. Gluten free. AVOCADO THAT GOES ON FOR DAYS. I sat there by myself and ATE ALL OF THAT TOAST. ALL. OF. IT. A good spot to eat and read a book (I did!). All of the good vibes. I had 3 independent friends recommend this place and it did not disappoint. Seriously, the best Indian food ever. Taste bud explosions on repeat. Everything was fabulous. My photos didn't do it justice (thus not featured). Click the link (title) to see the Bombay aesthetic. Peruvian tapas. Yep you heard that right. Another restaurant that makes your taste buds go BOOM. There wasn't one thing we tried that was mediocre. It's a small place, but packed with charm. Triyoga - they also have juices and wifi! Another great spot to post up to get some work done post flow! If you were watching my instagram stories, you learned that I may or may not have died during the Level 2 yoga class I took at Triyoga. It was a very challenging class. It seemed like everyone in the class was a regular, but they were very welcoming. Especially when I requested to be close to the wall once I learned there would be a lot of inversion work. The studio was pristine. They also do massages and pilates! So much to love! The Spitalfield Markets are a cool indoor/outdoor year round market. From jewelry, to plants, to baby clothing, you can find it all there! Oh and not to mention some incredible smelling food vendors- we unforch did not have an opportunity to try them though! We went on a Sunday, but they are open 7 days a week. I believe the vendors vary. Just a quick walk from the Spitalfields Market are the Brick Lane Markets (only on Sundays). Amazing vintage finds, handmade unique items, and MORE FOOD! (again that I didn't eat - I wasn't prepared!!) I didn't get any worthy pics of the vintage section because it was crazy crowded. But if you are into unique vintage finds, it's def worth checking out. Also of note, apparently up the road from there is a Sunday flower market. We really wanted to go, but we just got a little too cold. I hear its awesome if you are visiting in better weather. As you can see from the photo below, it's worth a stop just to eat at the cafe. Some truly incredible exhibits, and just gorgeously curated. Can you say Egypt? I would come back to this museum alone just for their Ancient Egyptian collection. I took the picture below, and right behind me was the ACTUAL Rosetta Stone. I almost missed it. This place is a must see if you are at all interested in history. St. Paul's - Westminster Abbey's less popular sister. This place is STUNNING! If you aren't going to services it does cost to tour, but totally worth it. Also, trivia fact, Princess Diana and Charles tied the knot here (instead of the Abbey) because it could hold more guests! It's one of the 2 places the royal family can get married. We are full on in spring mode now, so not sure how long the igloos will be around, but they were an amazing place for Saturday "brunch" when we were in town. The food was great- I mean can you see that pizza?! And the view of the Thames and Tower Bridge was even better. Speaking of views, Duck and Waffle has some of the best views in the city. And they had duck and waffle, which basically is an elevated chicken and waffles. It was to die for. My pics are dark didn't do it justice, so I didn't provide them. But it is definitely a perfect spot for a boujie night out.